Boasting intricate patterns and translucent colors, planetary nebulae are among the most beautiful sights in the universe. How they got their shapes is complicated, but astronomers think they’ve solved part of the mystery—with giant blobs of plasma shooting through space at half a million miles per hour. Planetary nebulae are shells of gas and dust blown off from a dying, giant star. Most nebulae aren’t spherical, but can have multiple lobes extending from opposite sides—possibly generated by powerful jets erupting from the star. Sahai and his team discovered blobs launching from a red giant star 1,200 light years away, called V Hydrae. The plasma is 17,000 degrees Fahrenheit and spans 40 astronomical units—roughly the distance between the sun and Pluto. The blobs don’t erupt continuously, but once every 8.5 years. The launching pad of these blobs, the researchers propose, is a smaller, unseen star orbiting V Hydrae. The highly elliptical orbit brings the companion star through the outer layers of the red giant at closest approach. The companion’s gravity pulls plasma from the red giant. The material settles into a disk as it spirals into the companion star, whose magnetic field channels the plasma out from its poles, hurling it into space. This happens once per orbit—every 8.5 years—at closest approach. 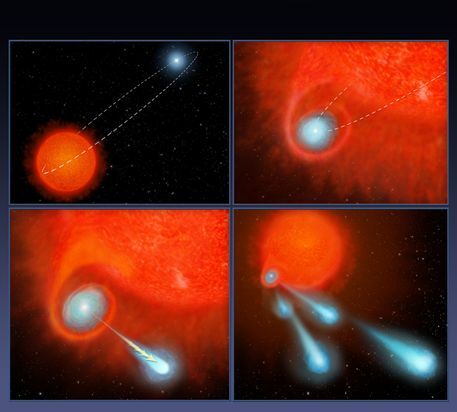 When the red giant exhausts its fuel, it will shrink and get very hot, producing ultraviolet radiation that will excite the shell of gas blown off from it in the past. This shell, with cavities carved in it by the cannon-balls that continue to be launched every 8.5 years, will thus become visible as a beautiful bipolar or multipolar planetary nebula. The astronomers also discovered that the companion’s disk appears to wobble, flinging the cannonballs in one direction during one orbit, and a slightly different one in the next. As a result, every other orbit, the flying blobs block starlight from the red giant, which explains why V Hydrae dims every 17 years. For decades, amateur astronomers have been monitoring this variability, making V Hydrae one of the most well-studied stars. Because the star fires plasma in the same few directions repeatedly, the blobs would create multiple lobes in the nebula—and a pretty sight for future astronomers.